I have a bit of a dilemma in my home; my young daughter works at Safeway ( her first job) but Albertson’s is more convenient a turn on my way home. I appreciate Safeway employing my young daughter and I am impressed with how they treat young people. My daughter is learning valuable life skills. So I try to split my grocery shopping between Safeway and Albertsons. In May Albertson’s started a loyalty rewards program. 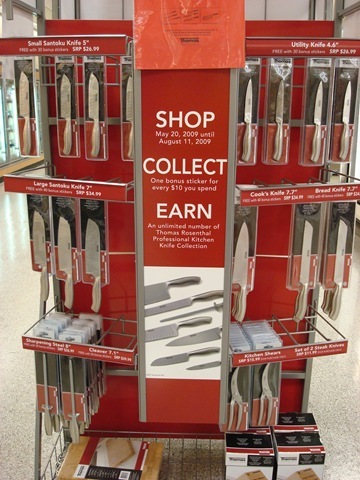 (Makes sense as the Safeway is across the street) They launched a program that rewards your loyalty for shopping at Albertsons with stickers that can be traded for a Knife set. I do not need a Knife set, but my son is moving into his first apartment at the U of A so I thought …why not? Since May I have been only shopping at Albertsons exclusively and I have been accumulating my little stickers to achieve my loyalty reward; a set of Thomas knives. I did an internet search and it turns out this set of Knives has a retail value of $899…wow, Albertsons must really value me! I have collected the stickers (through the teasing of my family members) and I filled the entire card and I am on my way to filling another. So I went to Albertsons to claim my prize and be able to proudly present this to my son. I was not sure how the redemption worked so I asked one of their workers at the front of the store and the first shoe dropped; “Sir, you do not get the “entire” set, you get one of the offers. 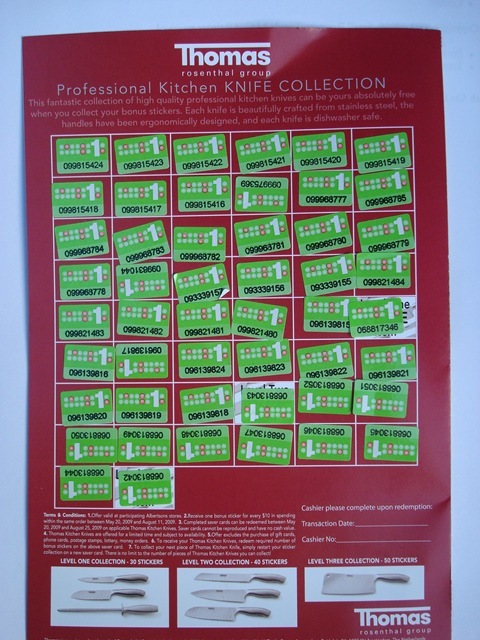 If you read the fine print here, you get to pick from one of three offering..a butcher knife, this set, or this set, and if you claim this set it is only 40 stickers so we will give you 10 back” Ok, I should have known better I guess. I wondered how they could offer an $899 set of knives if I purchased $500 worth of Groceries. However I did noodle it a bit, rationalize it….retail of $899 probably means a cost of $399, If I would ask Nick who has sourced products for me from China over the years to source these knives I could probably get them landed in the US for $199…so this loyalty program makes sense. Besides it is not the entire set for $899, but just some of the set. Now I’m really pissed! So other customers also were unhappy and Albertsons did nothing to help clarify the programs? If they did explain how it worked, and how you would need to spend $3600 for the complete knife set would it work? Doubtful! I am a big fan of loyalty programs and I feel there are very smart particularly in this economy. If done correctly they can build new customer trials and deepen the trust with your existing customers. If executed poorly, or worse requiring fine print, can cut your trust with your loyal customers. Here I come Safeway! I hate that you make me carry a little card to get the best price, or shout my home telephone number, but hey, you are treating my daughter well.